the League Management Company (LMC) yesterday descended heavily on former Nigerian Professional Football League (NPFL) champions, Plateau United for alleged acts of hooliganism, which marred their Week One game against FC IfeanyiUbah in Jos at the weekend. 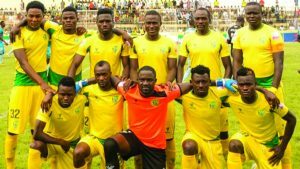 The match ended in a goalless draw, but fans suspected to be Plateau United supporters, led by one Attahiru Babayo, encroached on the pitch and assaulted match officials. For the infraction, the LMC yesterday ruled that Plateau United would play their next three home matches at the Ilorin Township Stadium, apart from paying a total fine of N5 million “for breaches of the Framework and Rules of the Nigeria Professional Football League (NPFL). The LMC also warned the club that it risked immediate three points deduction should a similar disturbance occur again during the current season. The sanctions against Plateau United as signed by LMC’s Chief Operating Officer, Salihu Abubakar, reads: “You are in breach of Rule B8.21 of the Framework and Rules of the Nigeria Professional League Football League, in that on Sunday, January 13, 2019, in the course of your Match Day 1 Fixture: Plateau United FC vs. FC Ifeanyi Ubah, you failed to provide adequate security for match officials when some of your supporters and other unidentified persons attacked and assaulted the Referee immediately after the match. The sanctions include a N1 million fine for failure to provide adequate security, another N1 million pursuant to Rule C12 being compensation to each of the assaulted match officials and in addition to any certified cost of treatment. The LMC gave the former NPFL champions 48 hours within which to accept the decisions or elect to appeal. “However, any of the two decisions the club may choose must be communicated in writing to the LMC and should the appeal fail, additional sanctions may be imposed,” it said.